Throwing out the vendors in your heart. I was sitting in my office next to a man who was weeping. Terrible and selfish choices made years before had caught up with him. He lost his career, his livelihood, his family, and his dignity. He was absolutely certain that God was punishing him. He begged me to help him find some penance. He wanted to read the Bible more. He asked me to help him learn Greek, so that he could read the Bible with better understanding. Would I to connect him someone who could teach him how to pray, you know… the right way. He asked me to find him places to volunteer in the church. He was going to give more financially. The grief and fear was palpable. I tried talking about what Jesus had already done for him. I tried to speak forgiveness and grace to him. In his certainty he could not hear me. He was convinced that if could do the certain sacred things in the right way, God would be pleased with him. God would forgive him, Maybe God would even bless him and restore what had been lost. I’ve never been in quite the same situation since, but in twenty years of pastoral ministry, I have learned that this man’s story, while extreme, was not unique to him. His practical theology, shared by so many, was that a relationship with God was all about making the right transaction. We may not be weeping in a pastor’s office trying to pray or read or serve our way out of consequences, yet, many of us have some echo of this in our hearts. Instead of coming to church with enthusiasm about pouring our hearts out to God in worship, some of us come with a sense of obligation. Perhaps just being at church somehow meets God’s check-list for us. Instead of reading scripture because we want to grow in our ability to recognize God’s voice, or know God’s heart more, some of us trot out our annual Bible reading program, committing to make the long, dismal slog because Good Christians™ read their Bible all the way through. Instead of giving financially because we want to grow in gratitude and be freed from the powerful grip of materialism, some of us write out that check as an insurance policy. We drop a payment in the basket on the hope that God will bless us, maybe return some of it to us, and it will prove we’re committed. Some of us have confessed our sins over and over, promised to live right again and again, taken on new religious activities, been baptized multiple times. Some of us do this because we hope that in doing so, God will take that offering in exchange for something we need — a blessing, an answered prayer, peace, eternity. We’re not obeying. Nor are we’re living out an act of love. Not really. We’re making a deal, turning our spiritual life, our relationship with God, into a spiritual transaction. Trading something we have for something God has, trying to purchase our way into God’s grace. This is not the life that Jesus led us to. One particular incident in Jesus’ life speaks to this directly. Jesus made his way to the temple at Passover. You can read the story in John 2:13-23. Entering the the temple court Jesus sees a bustling market. Money changers trading Gentile currency for temple coin. Animal vendors selling sheep and doves for the sacrfices. Jesus scans the room. He gathers up some leather cord into a makeshift whip. With a shout, he disrupts the marketplace, sending vendors and animals running. Now, here’s something you need to get clear. The vendors were not encroachers. There is nothing in the text to say that they were profiteers. This marketplace was a necessary part of the system that had evolved in the temple. Why? Well it’s simple. The practical theology that evolved around the temple system went like this. God dwells in the temple in Jerusalsm. In order to please God, to find forgiveness, or give thanks, you must offer sacrifrices. Those sacrifices can only be made at the temple. Convenient, if you happened to live in Jerusalem. But what about all the Jews who lived outside of Jerusalem, or even outside Israel? It was Passover week. Faithful Jews from across the region were flocking to the temple. But it just wasn’t practical to drive a sacrficial animal hundred of miles. What if the animal stumbled along the way? What if you made a once-in-a-lifetime trek to Jerusalem only to find that your sheep fell ill, and you would be unable to offer your sacrifice at the temple? Only pristine animals were acceptable. That meant there had to be a source of animals for sacrifice right there. Those animal vendors were necessary. Then there was another problem. The money you carried in your pocket, that you had saved over the year so you could buy your sacrifice, that was the coin of the empire. Coin marked with the embossed face of Ceasar. That coin was a graven image, banned in the Ten Commandments and not allowed within the temple. In order for you to buy your sacrificial animal, you had to exchange your filthy, ritually unclean gentile money for the clean, acceptable Temple coin. That means those moneychangers were also necessary. When Jesus shouted, “Stop turning my Father’s house into a Marketplace,” I don’t think he was talking about these merchants specifically. These merchants were just a symptom. They were there because the system required it. When Jesus shouted, “Stop turning my Father’s house into a market place,” I think He was protesting what the temple itself had become. The temple had become a marketplace. Not a market place selling animals, a marketplace selling access to God. The tabernacle was meant to be reminder of God’s nearness, and even the rituals given in Deuteronomy were originally meant to remind people of God’s holiness and God’s mercy for them. But the tabernacle had evolved into the temple and the temple had evolved into a system and the whole enterprise had grown out of control. For so many people, religion had become just a giant transaction. Jesus was offering something different. There would be no moneychangers because there would be no one buying animals. There would be no animal vendors because there would be no temple. There would be no temple because there would be no sacrifices! The whole system was being replaced by a Person! A Person who would be the new temple, a new way to accessGod, not limited by geography, or financial resources, or the narrow ideas of some self-appointed gate-keepers. A person who would be the Once-and-For-All sacrifice. This event, quite perfectly, happened on Passover. Passover was the festival commemorating God’s liberation of the people from slavery in Egypt. In the temple, when Jesus threw out the merchants, Jesus was announcing His intention to liberate all people from slavery to dead religious rituals meant to buy our way into God’s good grace. Jesus shouted that message to everyone standing in the temple that day, stunned onlookers, as the business of the temple ground to a halt. He also shouts those same words into your heart. 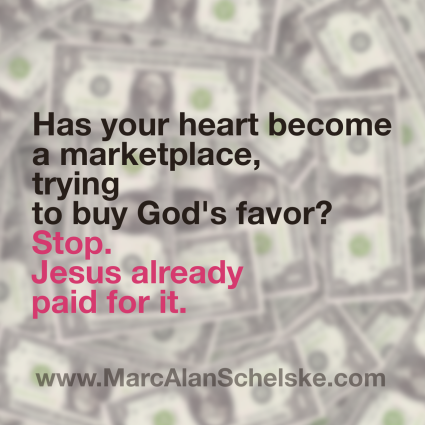 Has your heart become a marketplace, where you try to buy God’s favor? Are you holding on to certain actions and behaviors on the hope that they will secure your access to God? Well, stop it. Get these things out of here! Get rid of the marketplace. Your access has already and forever been paid for. Reflect on the lessons you may have heard in your life about this event from John 2:13-23. 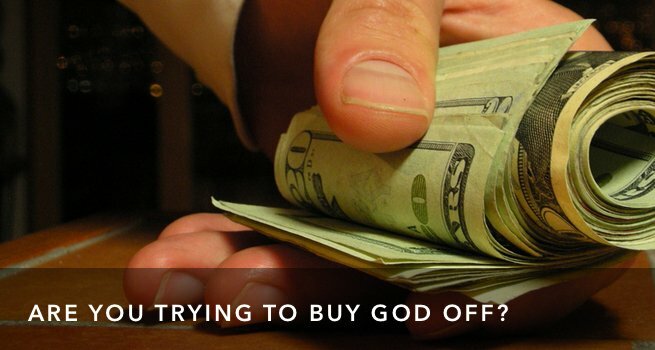 How have you seen religion turned into a marketplace selling access to God?